The Arabian Shipbuilding and Repair Yard (Asry) recently launched a new department dedicated to military projects, as it seeks to capture approximately 60 per cent of the regional naval market. The new Navy Defence and Industrial Projects (NDIP) department is headed by Anthony Haile, formerly of the UK Royal Navy. It is aimed at expanding Asry’s strong experience in the defence sector as a key differentiator from other regional yards. The firm currently has approximately 45 per cent share of the regional naval business, says a spokesman. Bahrain is host to two of the largest fleets in the region – those of the UK and US – as well as the nation’s own naval resources, and the company has been the popular choice for their repair work with 60 vessels having docked at the yard in the past five years. This number is set to increase dramatically over the next two years, as Asry invests heavily, including in the embedding of a new MAN Diesel workshop onsite as an original equipment manufacturer. This move alone is attracting US attention as its fleets primarily use MAN Diesel engines. 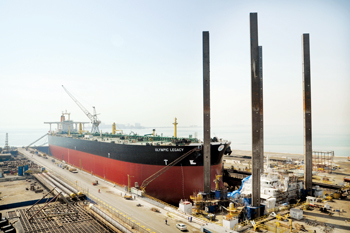 Asry is the Gulf’s most experienced ship and rig repair yard. Founded in 1977 in Bahrain, it has over 35 years of experience in marine asset optimisation. Its facilities include a 500,000 dwt (deadweight tonne) drydock, two floating docks of 252 m and 227 m in length, 15 repair berths with a total length of approximately 4,000 m, twin 255 m slipways, as well as a full range of workshops and service centres. The yard’s portfolio of capabilities is not only the largest in the Arabian Gulf, but also includes jack-up rigs and other offshore assets, due to a dedicated division – Asry Offshore Services. It also has an energy division dedicated to the production of unique power generation barges.